Since cave men discovered fire (if that’s the history you choose to believe in…) people have been burning things for a number of reasons. Used for all sorts of purposes ranging from keeping warm, to cooking and eventually as a weapon, fire has produced all sorts of tangible results. But when you hear people say, ‘where there is smoke, there is fire’, the opposite is actually more true. I’ve seen smoke where no fire has ever resulted. But 100% of the time, where there is fire, there is smoke. At some point, some man discovered that if I set this herb, plant, bush or whatever on fire, it produces a savory smell that I enjoy. Later discoveries included some medicinal purposes of smoke, and smokes curing factor on meats and food stores. But as man refined the use of smoke, and in the process refined himself, smoking plants quickly became a source of relaxation, fun, and just a pastime enjoyed by many still today. So, if one is going to enjoy smoke as a personal savory item, how does one store that smoldering mix of plant product? To make a long story short, the pipe (or something like it) was invented out of necessity, and has been morphing and growing to become the smoking pipe market we see today. There are a plethora of materials used to make pipes. Of course we know briar is the world’s preeminent choice for smoking pipes. 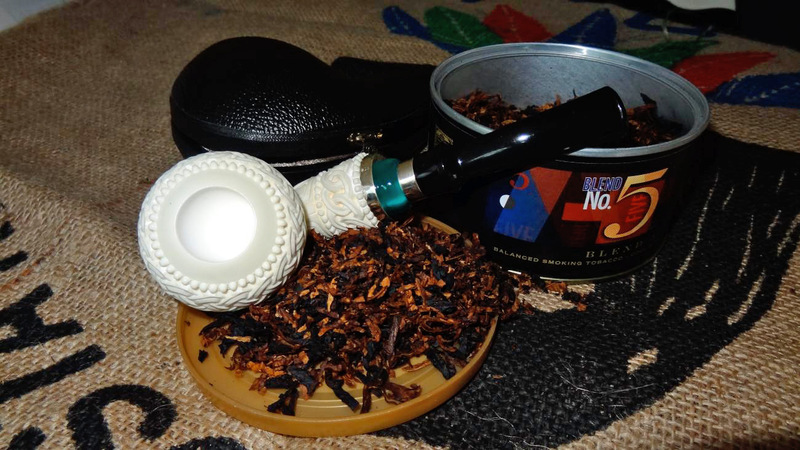 While other fine woods like olive, cherry, walnut, strawberry and many others can be used, the most popular alternative to briar by far is meerschaum. Meerschaum, also sepiolite, is a soft white mineral that occurs naturally throughout the world, but is found in greatest abundance in the Mediterranean regions. Meerschaum is specifically magnesium silicate, a soft (somewhat opaque) gray to white mineral that is soft and easily carved, is an excellent insulator, and does not burn. Not only used for pipes, meerschaum has historically been sourced to make carvings of all sorts including dolls, jewelry, small statues and figurines, and incense burners. Meerschaum is typically found in small nodules, but can also be ground into a powder form and reconstituted with any number of binders to produce a malleable plaster type substance that can be used to coat or line almost anything to produce a heat barrier or general insulator. Although the ground and reconstituted meerschaum is less porous and therefore a less effective insulator, it is still commonly used for the aforementioned purposes. Meerschaum is currently obtained in greatest abundance in the Eskisehir region of Turkey between the cities of Istanbul and Ankara. 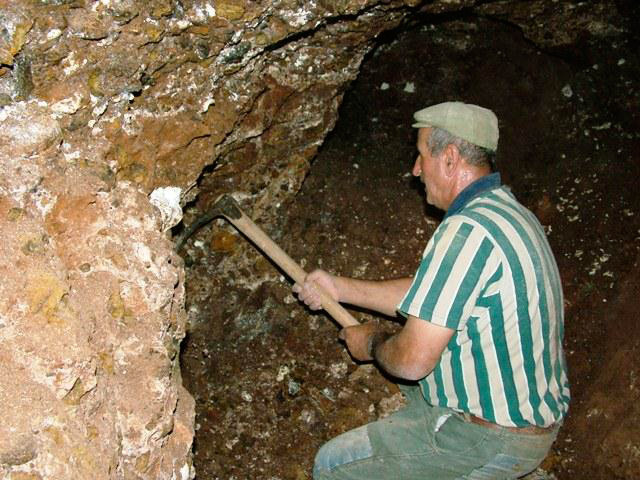 It is said that the mines in Eskisehir total over 4,000 in number—and are by sheer volume, the richest meerschaum mining fields in the world. 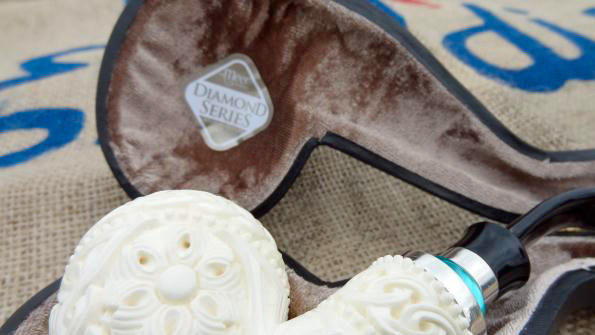 When first mined, meerschaum is soft, much like soap, but hardens with exposure to air and heat. Less dense than water, meerschaum in spite of being ‘rock’, actually floats on water. Sometimes found floating in the sea, meerschaum earned the nick-name ’sea-foam’ which is still used today. 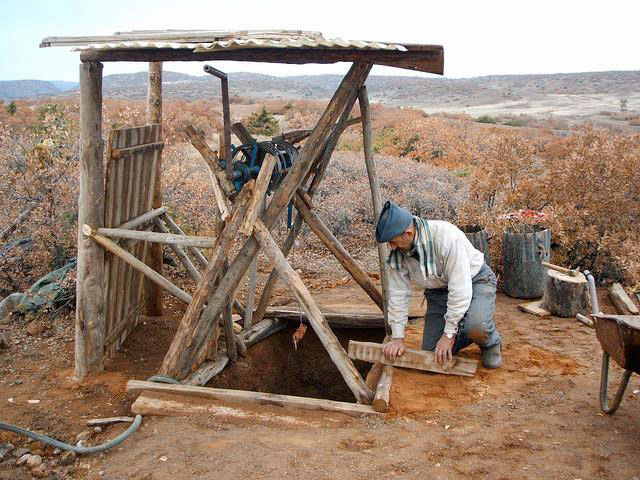 Mining techniques are still quite primitive to western standards, but the industry is safe and thriving. Turkey has banned the export of meerschaum blocks, in large part due to the collaboration and hard work of the Uzkesici family. This acted in driving the meerschaum pipe business to largely center itself within the borders of Turkey. While there are several sources for carved meerschaum pipes, few sources are as old and storied as the business run by the Uzkesici family. Uzkesici Meerschaum as a business formed 50 years ago in 1963. In 1999 the family added an on-line presence that can be found at www.meerschaumstore.com. Whether you are an importing wholesaler, dealer, or retail customer, service is preeminent, and the pride behind the quality of the product is apparent. All pipes produced by The Meerschaum Store are hand carved by select Turkish carvers from select grade, properly aged meerschaum block. I first came to know Cem Bahadir Baykal, cousin to Tekin Uzkesici and operating manager of the Meerschaum Store, by means of introduction from my publisher Kevin Godbee here at Pipesmagazine.com (follow Pipesmagazine.com on Facebook). He knew I had been looking to review a meerschaum pipe and contacted Cem at the Meerschaum Store. Cem agreed and before long I received notice from him that the pipe was on its way. Meerschaum pipes, while sturdy and excellent platforms for carving smoking pipes, are more delicate than briar pipes. This pipe arrived packaged securely in a well packed box, and inside the box the pipe itself protected in a stylish and ample hard-shell case. Cases are typical when purchasing meerschaum pipes, so this was expected. The case is dark brown in tone, is textured to ensure a good purchase, and is outfitted with a stylized brass clasp, and two matching hinges. The clasp is far more than just decoration, and held the case closed securely. An audible ’snap’ is detected with each entrance into the case, and I doubt very seriously I’ll have any accidental openings. Inside, the case is form fitted to the pipe allowing no room for movement that might cause damage to the pipe while in transit or storage. Its interior is covered with a very formal looking champagne-colored velveteen lining that sets the look off nicely, adding a distinct flare of elegance to the package as a whole. The pipe itself is of their Diamond Series as is indicated by a sticker inside the case, and like a well cut diamond, this pipe popped! A floral pattern carved the entire surface of this pipe, with not a smooth edge anywhere except for the bowl’s rim. It was spectacular! A far more ornate design than I had expected to see for this review. A soft cream color of the stummel to my left, the highly polished acrylic stem to my right, and sandwiched in between were two sterling silver rings book-ending an absolutely stunning turquoise colored acrylic stem accent. I took the pipe to work with me the next day to show it off. I displayed the pipe to one man at a time, and watched intently waiting for the expression that would appear on each person’s face. As the pipe revealed itself as I opened the case each time, the results were priceless! Reactions were indistinguishable from one another, with each reveal causing jaw-dropping effect. This being the first ornate meerschaum I owned, I wanted to learn more about care and maintenance for such a work of art before I proceeded. Thankfully, the Meerschaum Store has published much information about this. I had owned meerschaum before, smoked meerschaum before, and have owned several meerschaum lined pipes. I’m not totally unfamiliar with meerschaum. Comparatively, I have also owned automobiles all of my adult life. I know how to take care of them drive them, maintain and repair them. I’m a competent home mechanic and have a great track record of keeping my cars in a safe operating order. However, if I were suddenly given a Ferrari or Porsche, I’d want to bone-up a bit on proper maintenance and care of such a fine car. I simply applied the same principal here. I’ve attached what I learned from my research as a post-script to this article. With that knowledge in hand, I moved on. In the case of this carved beauty, the floral print is just remarkable. Again, covering the entire body of the stummel, it shows vines, flowers, dots, leaves, and ornate reliefs of all types. 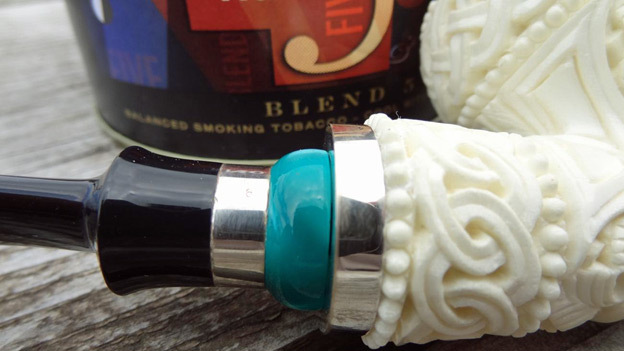 The aforementioned soft cream color on the outside is a shade developed from the application of a double layer of bees-wax – something that the Meerschaum Store does with all their Diamond Series pipes. A quick look inside the bowl reveals a shade of white that is so bright it seems self-luminescent! Cem states on their web site, “Eskisehir (produces) the purest and whitest, most easy to engrave Meerschaum in the world.” Looking in this bowl, I have little doubt. Working as I do in manufacturing with lots of machines producing all sorts of parts, I know what tooling marks are, how to identify them, and it is easy for me to perceive by close inspection how something is produced. I can assure you that these pipes are hand carved! There is stunning beauty in the tiny facets left by fine hand-cutting strokes on the meerschaum. As a hand tool glides over the surface of the meerschaum, with every start and stop, small lines are left. Most of these are removed during finishing, but in the deep recesses of the relief work, some remain to be seen. I find them as priceless individual marks of quality that will not be found on a machine cut meerschaum block. The shank is adorned with a 925 silver ring, that I’m sure helps protect the tenon system in the shank, while at the same time providing a spectacular look. What in first appearance looks to be a flaw or blemish on the silver band, is in fact a cartouche testifying to the purity of the silver. This particular pipe was carved by Tekin, who retains the title of Master Artisan at the Meerschaum Store. As advertised it was carved from solid block, Grade 6 Meerschaum. His work is well known as being excellent, and he is a highly rated carver often used for custom commission pieces. The grade of block meerschaum is rated on a scale of Grades 1-6, with 6 being the best. This grading system was first introduced by the Uzkesici family and the Meerschaum Store. The grading takes into consideration both the quality of the meerschaum itself, but also the workmanship of the finished product. Every product comes with a product label detailing the grading, and includes the name of Carver. This helps make each pipe seem like a personal gift. The finish is always something I cover when reviewing a pipe. 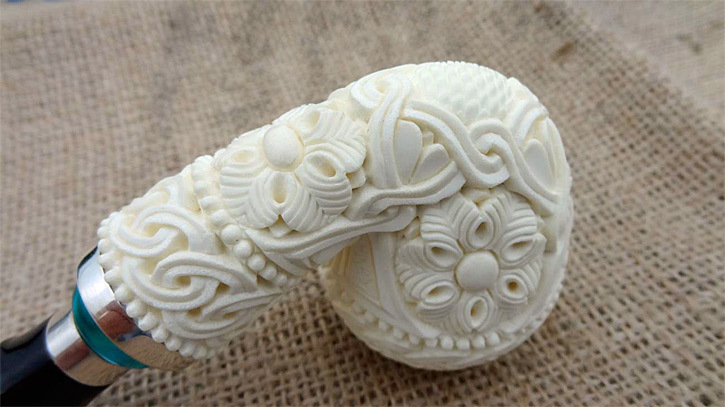 You might think that because it is a meerschaum pipe that there is not much to discuss about the finish. In the case of this individual pipe, we know that it has a hand-applied double coating of bees wax. The bees wax works to protect the surface of the meerschaum from collecting too much dirt that may be transferred from the smoker’s hands, and it adds a protective coating “seals” the meerschaum, while still allowing it to breath. 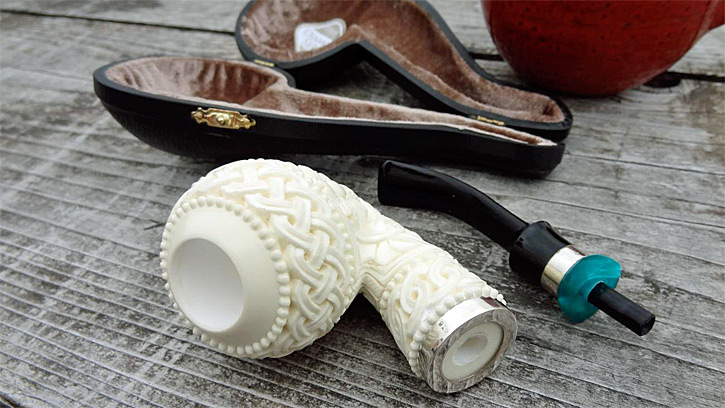 Collectively, meerschaum finishing is seeing some modern advances. Smoked finishes are not available in some pipes, and we are also seeing coloring or dying of meerschaum as well. 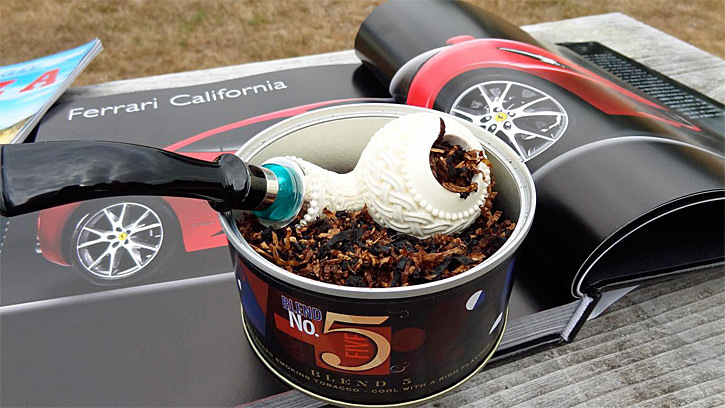 While these finishes may not be completely new, as if they have never been done before, they are adding a great deal of colorful excitement to the marketing of meerschaum pipes, and coloring is gaining a foothold in the area of popularity. The stem on the pipe is an equal piece of art worthy of its stummel. Turned from acrylic rod, drilled, shaped and polished to a nice sheen, it is supremely smooth along the length and bit. Contoured to add an adorning flair to the stem, it settles into its own sterling silver band, and finally capturing that dramatic turquoise accent. Because this is a high grade meerschaum pipe, the shank is fitted with a Teflon/Delrin tenon. This tenon is threaded into the meerschaum so that removal and refitting of the stem for cleaning does not damage or continually wear on the meerschaum itself. This is something to be aware of on this or any meerschaum pipe with a similarly fitted stem. The tenon system is unique to almost exclusively meerschaum pipes. Because they are fitted with threaded in tenons to add life to the pipe, removing and re-inserting the stem should always be done with care, and it is recommended that it is done in a consistent clock-wise twisting motion. Drilling the vent resulted in a near perfect entrance into the heel, and added more evidence to the engineering prowess put into this pipe. Being a nearly full-bent design, I can find no reason to fault the engineering of this pipe at all. Airflow is seemingly turbulence free and consistent. The tenon fit is excellent and a soft clock-wise twist allows for smooth separation, or reattachment. For this pipe I carefully chose a new tobacco. Sutliff Private Stock blends have long been some of my favorites, but I felt like this pipe needed something a little more English then the aromatics I like so much. That being the case, I assigned this job to Sutliff Private Stock Blend No. 5. First of all, the tin note was nose grabbing! It told me there was some substance to this blend and made me want it all the more. The Latakia was duly present and clearly the central theme of the blend, but there was a lightness to it that seemed to imply that it would not be overpowering. As Sutliff Private Stock English blends go, the level of Latakia in No. 5 is only matched by one other (a Balkan blend I will cover in a later review), and the rich smoky tin notes were very appealing, with the Virginias and Burley adding some balance. 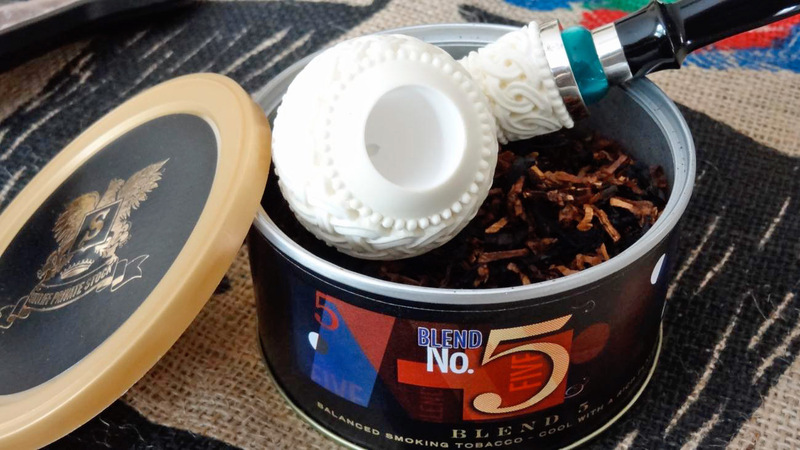 Attractively packed in the 1.5 oz tin, I pinched the blend and began to pack the bowl of the floral meerschaum. Acting more delicately (more out of respect for this museum quality piece), and with the bowl packed to my desire, I put my lighter to work igniting the Blend No. 5. The pipe performed admirably, as was to be expected. The bit was soft and smooth to the mouth, and the pipe was comparable in weight of similarly sized briar pipes. With the size and bend of the pipe, it rests well below the nose, and when not enjoying the taste in your mouth, the aroma off the bowl is pleasant and easily gathered, reminiscent of classic English tobaccos. 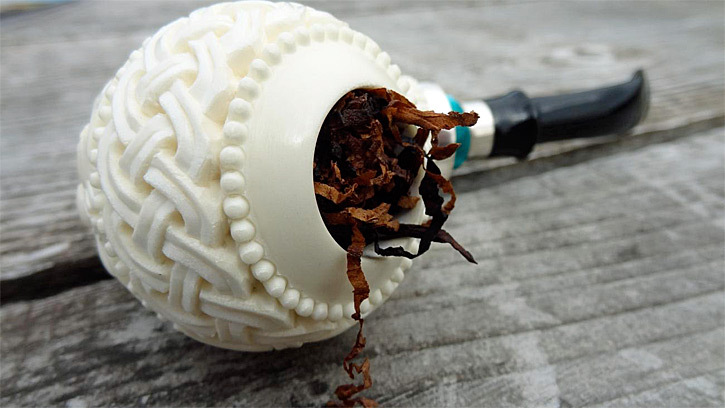 The meerschaum stummel worked in conjunction with the tobacco itself to offer a dry cool smoke. With more nooks and crannies than a Thomas’ English muffin, or perhaps a crumpet, the meerschaum’s surface area radiates heat away almost as fast as it can be produced, making it comfortable to hold for the entire time of a long, relaxing smoke. 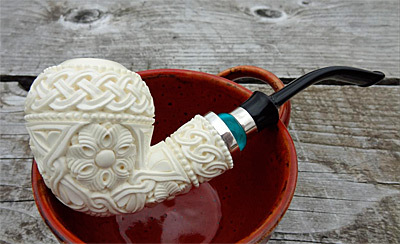 Meerschaum pipes are more than just smoking pipes. 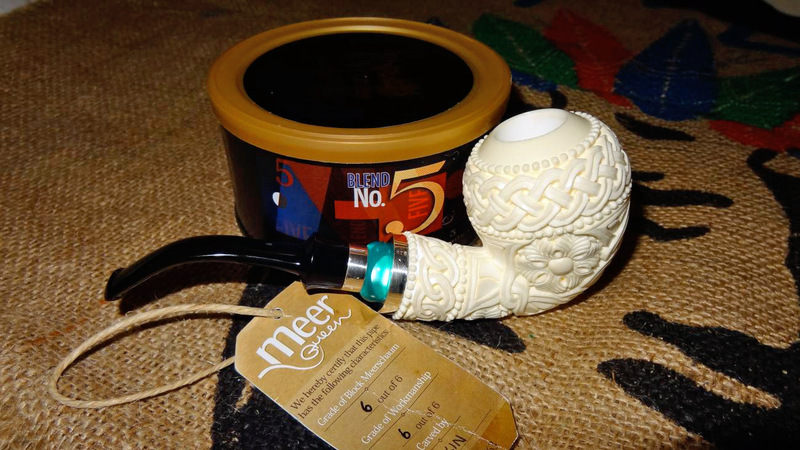 A meerschaum pipe from MeerQueen and the Uzkesici family is more than just a meerschaum pipe. With 50 years’ experience in this business, these pipes truly are museum quality pieces that should become heirlooms passed from generation to generation. This floral model is truly exquisite. I can look at it for hours, just admiring its form, and pondering about the man that took the time to carve this beauty. The time, the patience, the spirit that went into its carving. Sure, there are probably others like it, and there will probably be more. But THIS pipe rested in the leathered and yet caring hands of a man who loves his work so much that his heart’s desire is to see you and me smile every time we pull out this pipe. Mission accomplished. I now own a piece of Uzkesici family’s life work, and a piece of the history of Turkey. I will not forget that. Case: Yes, comes with fitted case Accessories: 925 silver band Quality: Top-grade block meerschaum | Museum Quality Waxing: Double layer beeswax Height: 51 mm / 2.0 inches Lenght: 145mm /5.8 inches Bowl Inner Dia : 19 mm / 0.8 inches Bowl Outer Dia : –mm / — inches Weight : 46 g. / 1.6 oz. Meerschaum is a porous mineral. 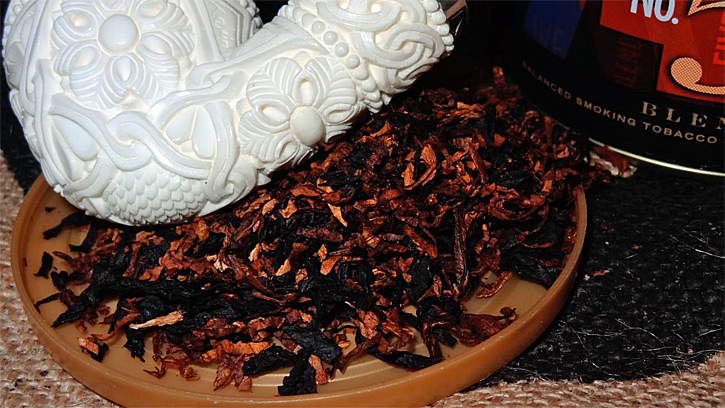 Most of you are aware that meerschaum takes on the tars of the tobacco as it is smoked and changes color over time. You may also know that all quality meerschaum pipes, and certainly all the meerschaums from the Uzkesici family, will be coated with a light coating of bees wax to help keep particulate matter from darkening the outside surface of the pipe. 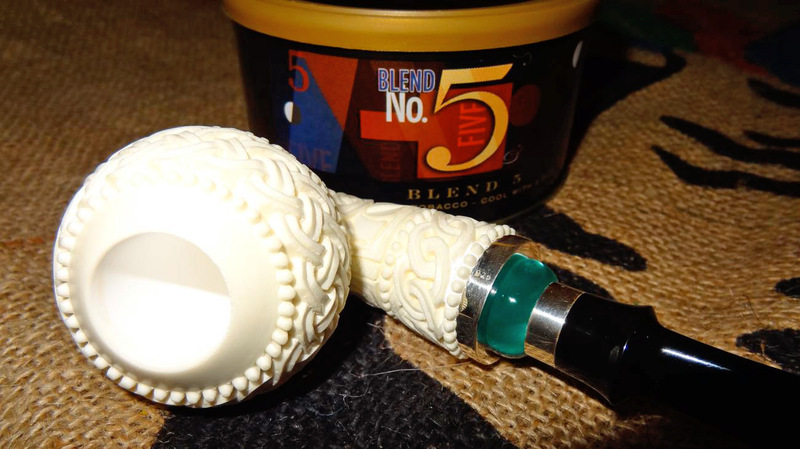 While the wax coating is an excellent idea, in practicality, it will matter far more to the collector who will be using the pipe more as a museum piece than a smoking implement, because for the owner planning to smoke his meerschaum, it will begin to color form the inside-out in any case, turning all shades of tan, brown and eventually darker yet. In the end, do not be afraid to handle your meerschaum pipe with clean hands. It’s your pipe! Touch it, feel it, get used to what meerschaum is — enjoy it! Don’t tap your meerschaum against a hard surface. If you tap it in your palm, be sure to support the shank, as well as the mortise/tenon area firmly with your hand. While this is good advice for briar pipe smokers as well, take extra care with your meerschaum. To clear the bowl of your meerschaum pipe, simply tip it upside down. Most of the ash should fall out if it is a well smoked bowl, and for what does not fall free, use a common pipe tool gently to loosen it and remove. Unlike briar, don’t let cake develop in a meerschaum pipe. Typical briar style breaking in of a pipe is not necessary. Meerschaum pipes, unlike briars, do not scorch or burn and hence need not be protected by a cake build up. Remember that the meerschaum is often softer than a normal cake build up, and it reacts to heat differently as well. Tobacco cake will expand as it heats, and do so at a rate faster than the meerschaum mineral. Leaving the cake build up, will run the risk of cracking the meerschaum bowl. If cake has developed in your meerschaum, it cam be removed by traditional reaming or scraping methods, but extreme care must be given while doing so as a metal reamer will remove meerschaum as quickly as it does cake. After smoking your meerschaum pipe, it will be wet/moist and SOFT, especially in the heel. Apply extra care at these times when cleaning, handling, and preparing to store your pipe. Meerschaum is very vulnerable at this stage and must be cared for gently.